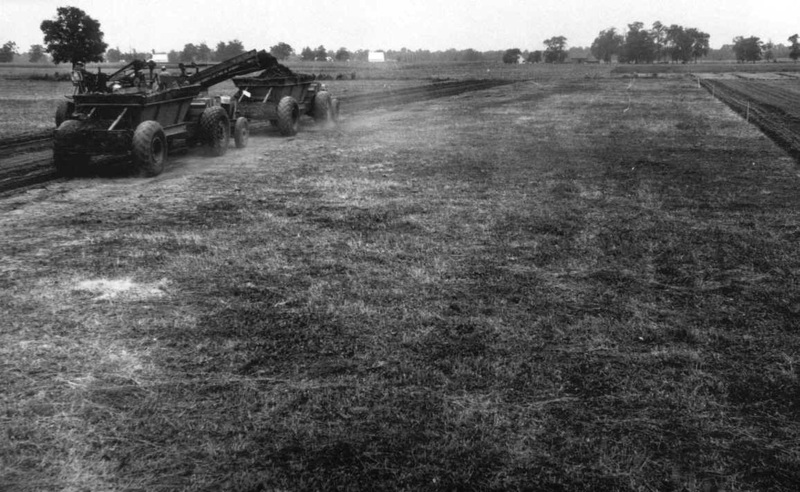 During 1942, the War Department acquired land near Columbus to build the Air Support Command Base. Captain Hammon arrived at the proposed construction site July 29, 1942. Captain Hammon's last day at the field was December 4, 1942. He left for the District Office, Louisville, in a bleak snowstorm with his secretary's (Audri) face pressed against a window weeping. Engineer and Base Commander at time of construction. 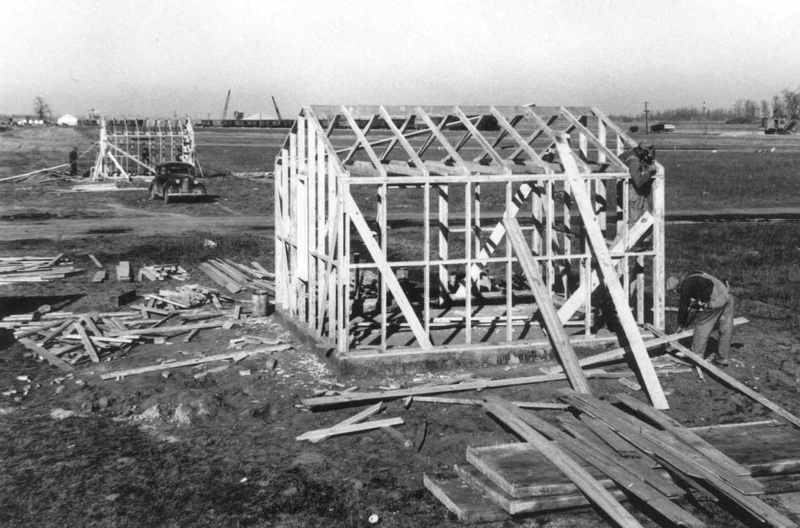 Base construction started August 1942. (according to the Job Diary, the actual construction commenced Wednesday August 19, 1942) War Department U.S. 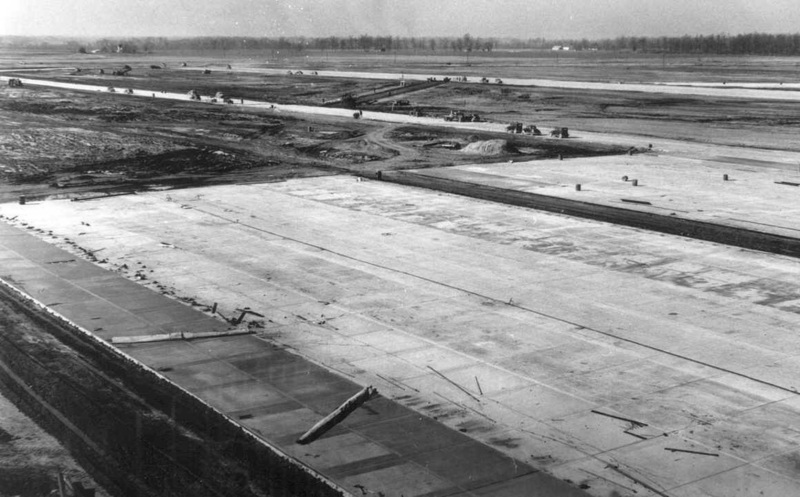 Engineer Office Louisville District photographs show the progression from farm land to air field. Some of the contractors were Kramp Construction Company and Koch Construction Company of Milwaukee, Wisconsin, contract number W559eng-6393. 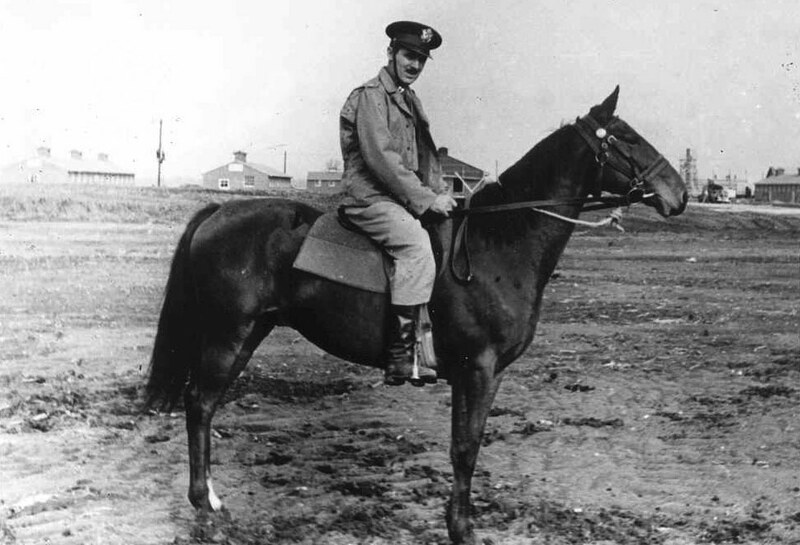 Captain Stratton O. Hammon and his horse Spencer, November 1942 . When the mud was too much for a Jeep, horses were the best mode of transportation to oversee base construction. 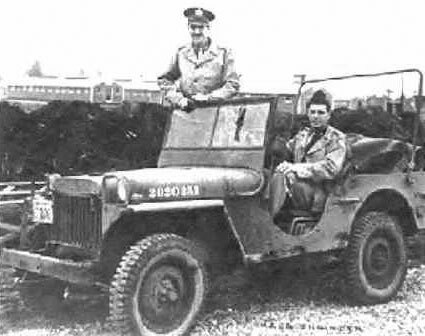 This October 1942 photo from an article in the September 8, 1985 Columbus, Indiana Republic newspaper is of Captain Stratton Hammon standing in the Jeep and 1st Lt Austin Griffith behind the wheel. The newspaper article was entitled, "Citizen soldier helped get Atterbury Field built." "Each contracting officer had a monetary limit. My limit was one million dollars a day. If I needed to spend more, which I frequently did, I had to telephone my colonel whose limit was ten million dollars a day, equal to approximately a hundred million by present standards. Between July 1942 and July 1943, my Colonel, with about a half-dozen area engineers, spent an amount equivalent to approximately a billion in 1985 dollars." View looking northeast from the center of the field on the North South baseline. East view from near the northwest corner. 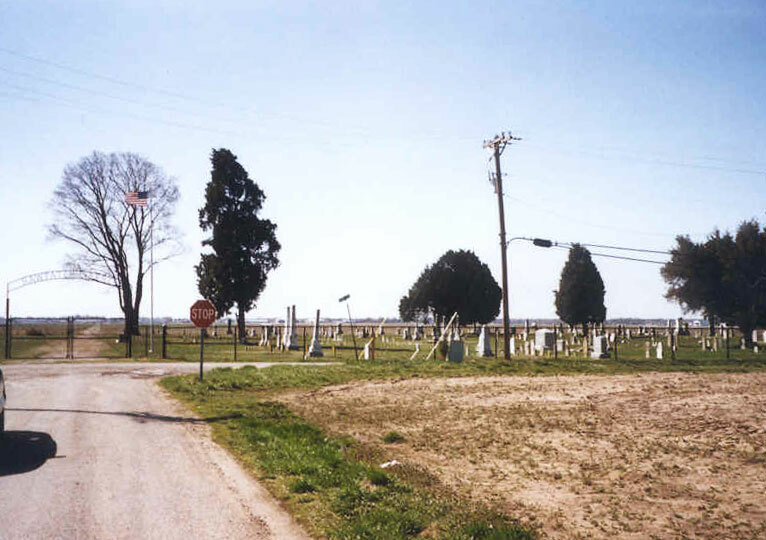 South view from the north boundary showing cemeteries on either side of the road. 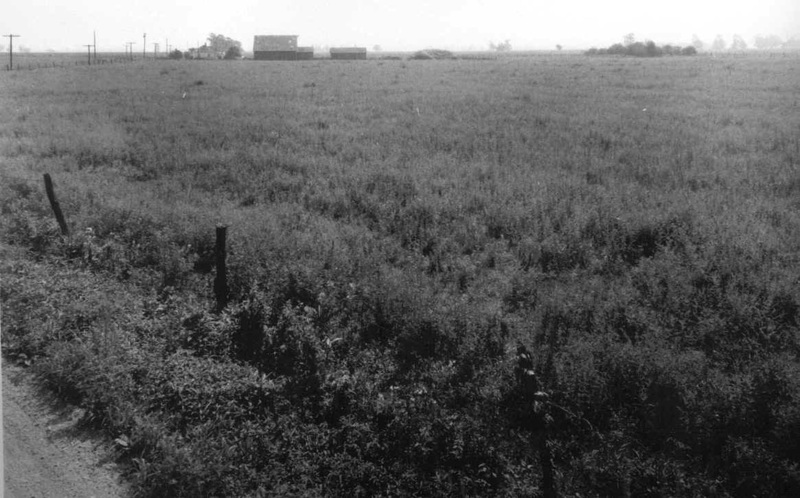 A view of the Hawpatch-Liberty Cemetery as seen over sixty years later. The cemetery is on the North side of the former air base property. The cemetery photos taken in 1942 and recently are looking south to the main area of the airfield. 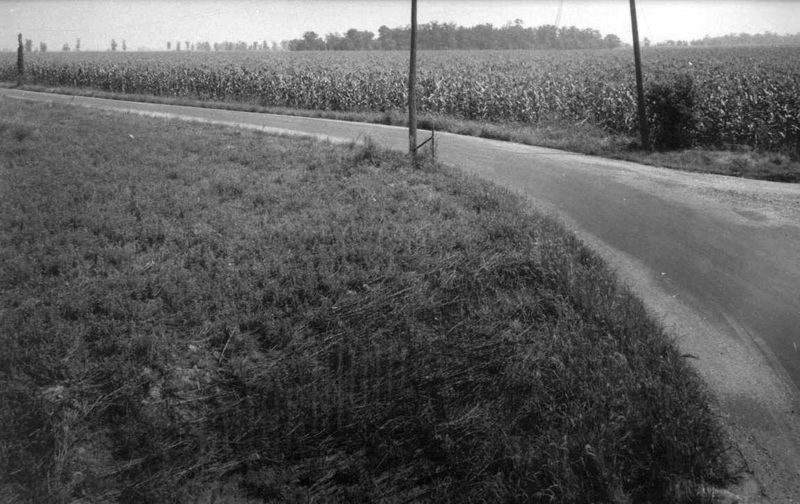 Columbus, Indiana pre-construction photographs taken in 1942. East view from North-South baseline. Pennsylvania Railroad right of way from the intersection of the north-south and northeast-southwest lines. 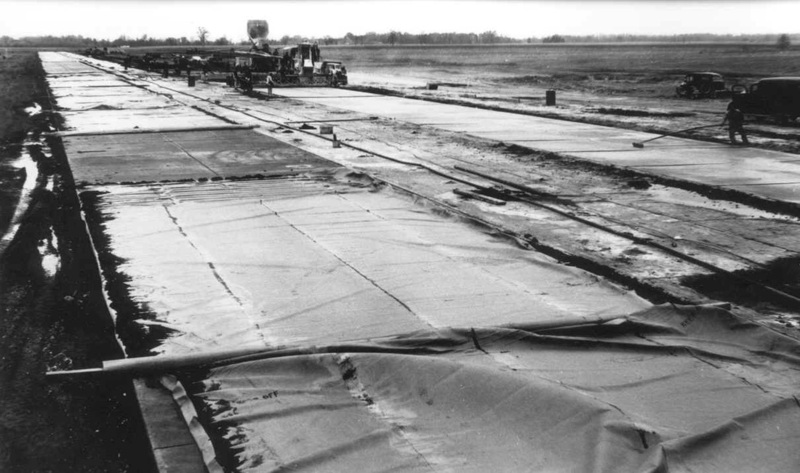 Stripping of top soil from south lane of the East-West Runway view looking west. Columbus, Indiana pre-construction photographs taken in 1942. East view from North-South baseline. 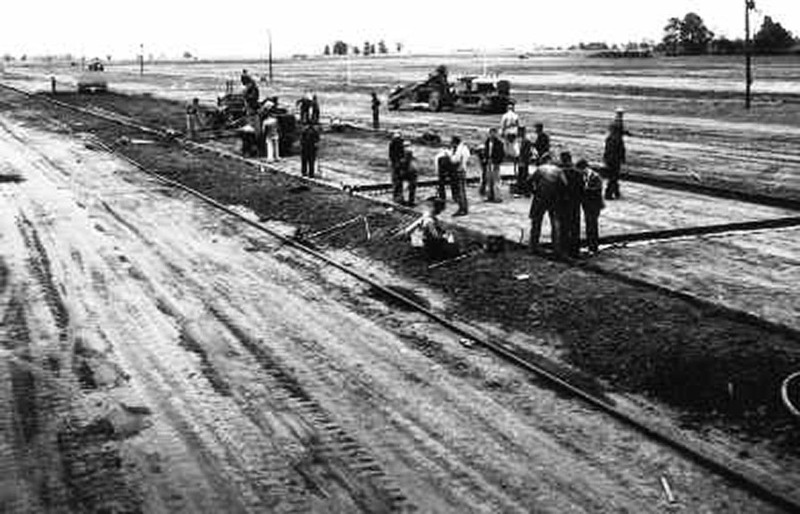 Construction of railroad spur tracks looking north. 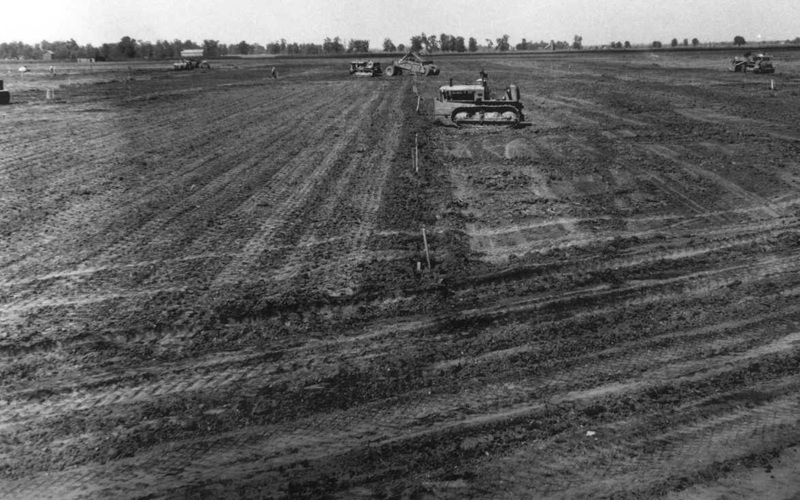 Fine grading operations north south runway fall 1942. Northwest view from the Control Tower showing part of the apron, taxiway and runways. 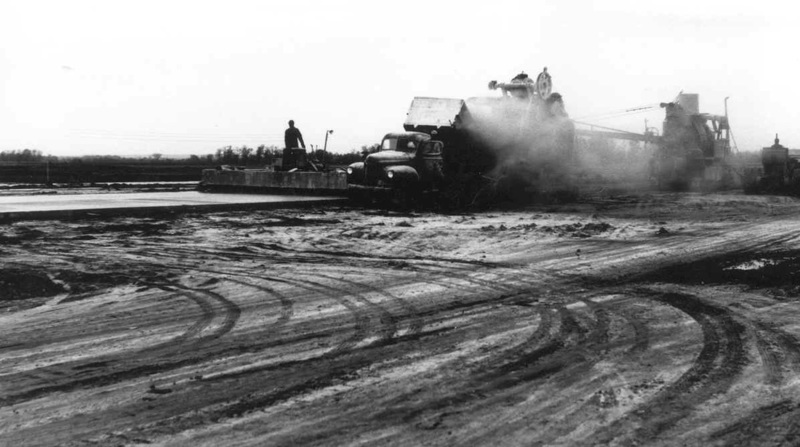 Cement content blowing during high wind at NW-SE runway 1942. 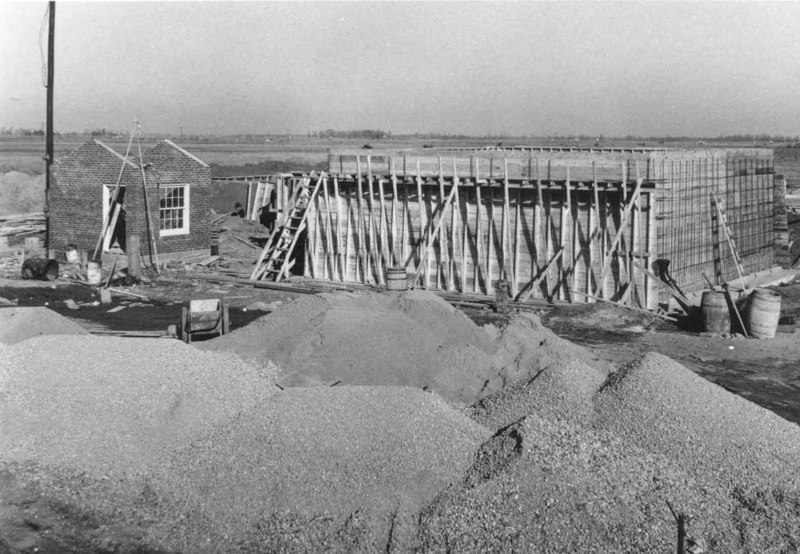 Buildings number 69 and 67 on 5th street east of "R" Street under construction by Pearson Construction Company, Benton Harbor, Michigan October 1942. 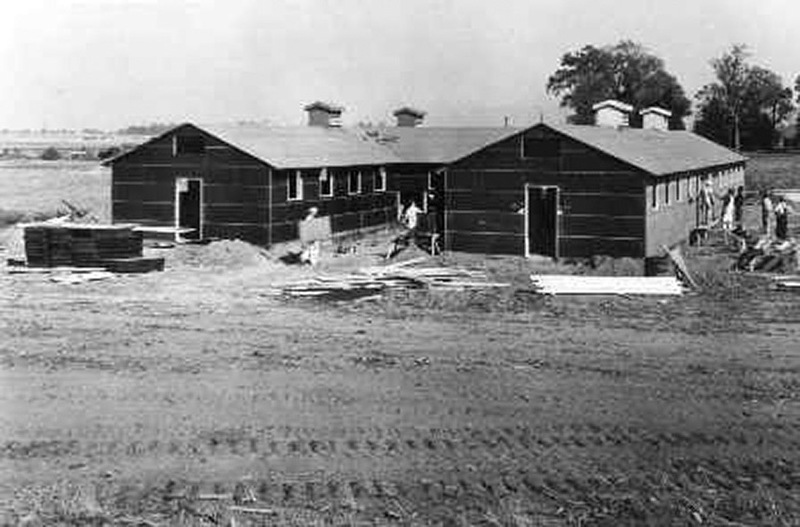 Buildings number 70, 79 and 80 under construction September 1942. Note the house in the background which will become building 131 the NCO Club. 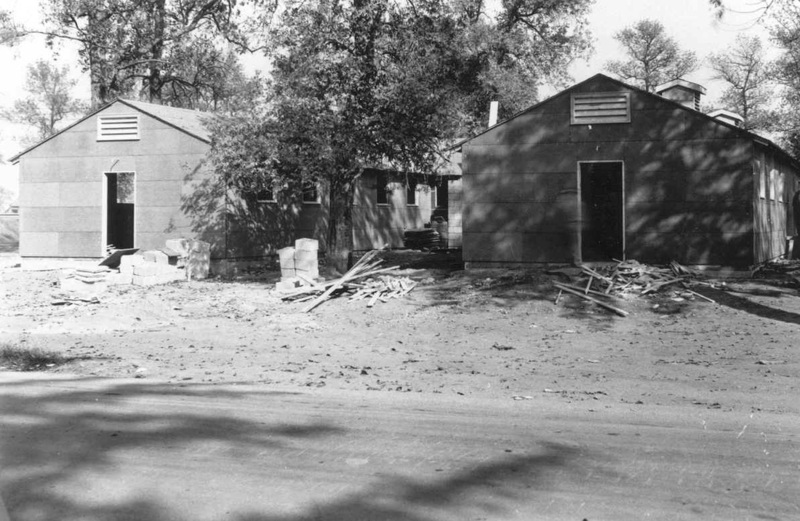 Building 109 Field Office October 1942. 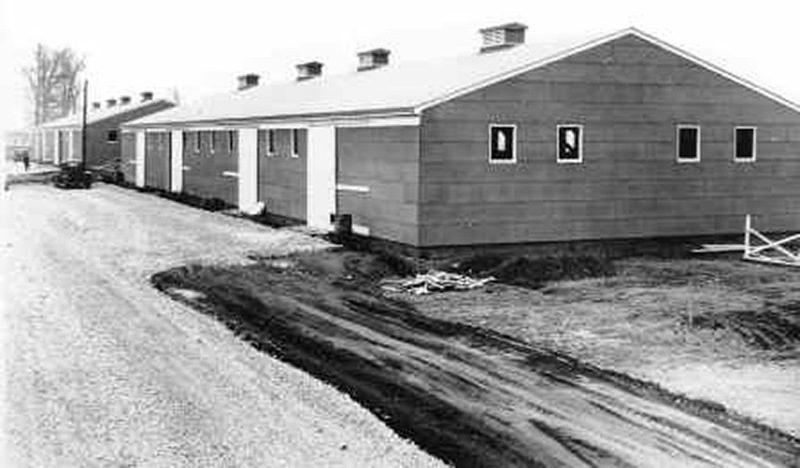 Enlisted men's barracks area northwest view from 5th and "B" Streets. 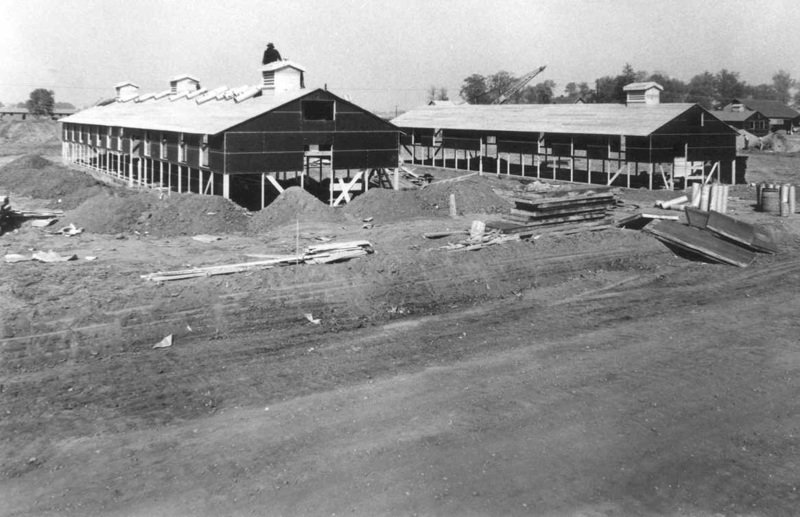 Construction of buildings in Officers' Area northwest view. Buildings 119 and 120 Ordnance Storage Buildings. Note the boxcars on the rail road track in the background. Construction of Sewage Disposal Plant by Birmingham Contracting Company, Birmingham, Michigan. Warehouse buildings #101 and 104 complete except for glazing. Building 101 being framed for Quartermaster Warehouse. Building #87 under construction just south of the apron. 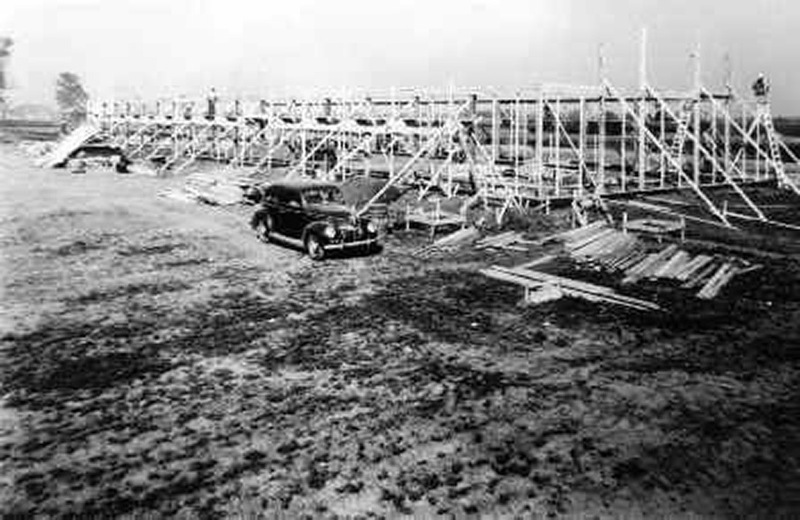 Building #87 was just to the south of the Control Tower. 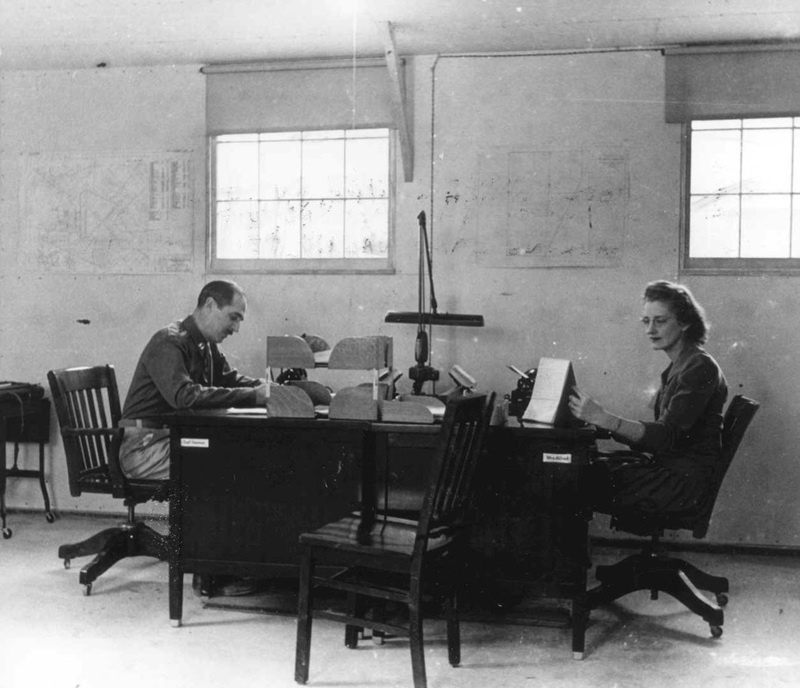 Captain Stratton Hammon, Commanding Officer and Mrs. Audri H. Allred, secretary in his office on the field November, 1942. Mrs. Allred was the wife of a soldier stationed at Camp Atterbury. 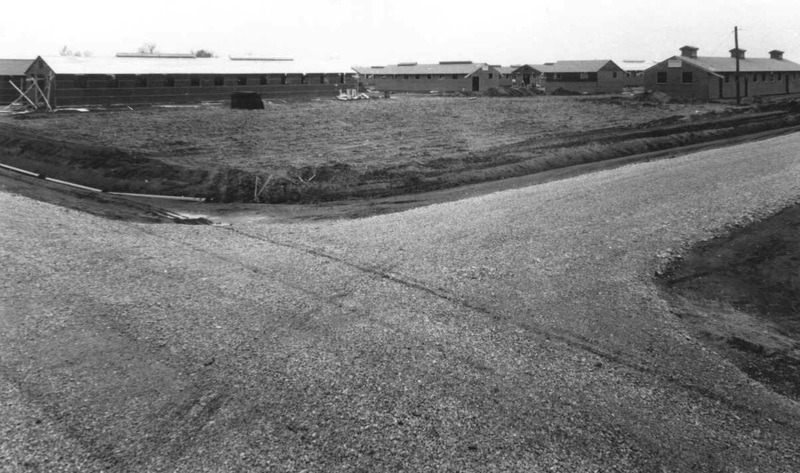 Camp Atterbury was also under construction. 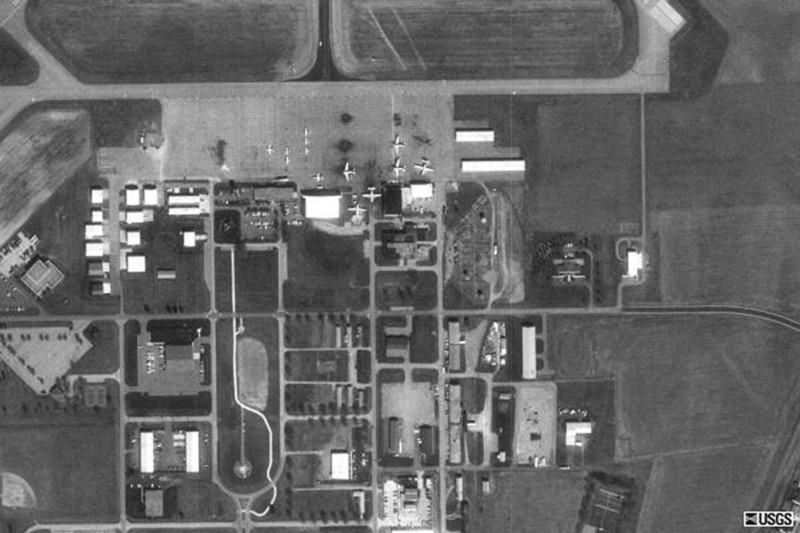 A view of the former airbase main building area which includes the Atterbury-Bakalar Air Museum, F-4 Phantom, Bakalar Green, the Jeanne Lewellen Norbeck Memorial Chapel, control tower, and rotating beacon. Captain Stratton O. Hammon, Area Engineer and 1st Lt. Austin Griffith, Assistant Area Engineer: Diary of Capt Hammon 7/29/42-9/21/42 by Imogene Crane, Secretary: 9/22/42-12/5/42 by Audri H. Allred, Secretary (Typed by Betty J. Flohr) Diary of Lt. Griffith 8/5/42-8/16/42 by Imogene Crane, Secretary: 8/17/42-12/5/42 by Betty J. Flohr, Secretary. Wednesday-July 29, 1942 Captain Hammon: Arrived at office of the Lawrence Advanced Twin Engine School, Vigo Street, Vincennes, Ind., at 7:30AM. Received call from Mr. Matthews of the Allied Architects and Engineers of Indianapolis, Ind., from the Brown hotel, Louisville, Ky.
Mr. Matthews informed me that his organization had signed an Architect Engineer Contract with Col. Henry Hutchins, Jr. the night before far an air field to be constructed at Columbus, Indiana, and to be styled Ground Air-Support Command Base, and that Col. Hutchins informed them that I would be the Area Engineer. Appointment made to meet Mr. Matthews, Mr. Lennox and Mr. Wright at the office of Land Acquisition Board in the Bassett Building, Columbus, Indiana on afternoon of the same day. Long distance conversation was held with the District Engineer at Louisville who ordered me to the District Office as of this date. Left Vincennes at 10:30A.M. and arrived at Columbus, Ind. at 1:00P.M., where conference was held with Mr. Matthews, Mr. Lennox and Mr. Wright, in the office of Mr. Springer at the Land Acquisition Board. The McKinley school was inspected as a possible office for the combined organizations and an agreement made with the Principal. Departure made from Columbus at 3:30 P.M., arrival made at the District Office at 5:30 P.M.
Thursday-July 30, 1942 Capt. Hammon: Most of day consumed in preparation of the opening of our Columbus office, with requests made through the various channels for transportation, supplies and personnel. Mr. Wakefield agreed to send Mr. Hager, Chief Clerk of Chanute Field, Ill., to our office. Fortunately Lieut. long was contacted in the District Office who was in telephone communication with Mr. Hager, and an appointment was made to meet him tomorrow at Columbus. Conference with major Gill in regard to the Project. In the late afternoon Mr. Lennox, Mr. Matthews and Mr. Wright arrived and a lengthy conference was held in the Design Section in an effort to speed the basic layout and secure approval from the Southeastern Air Command at the earliest possible moment. The first Field Progress Report was made out and signed. Friday-July 31, 1942 Capt. Hammon: The keys to panel truck U.S.A. 124 were turned over to the Area Engineer by Mr. Lammers. This was loaded with one typewriter and a box of office supplies by Mr. Moss. 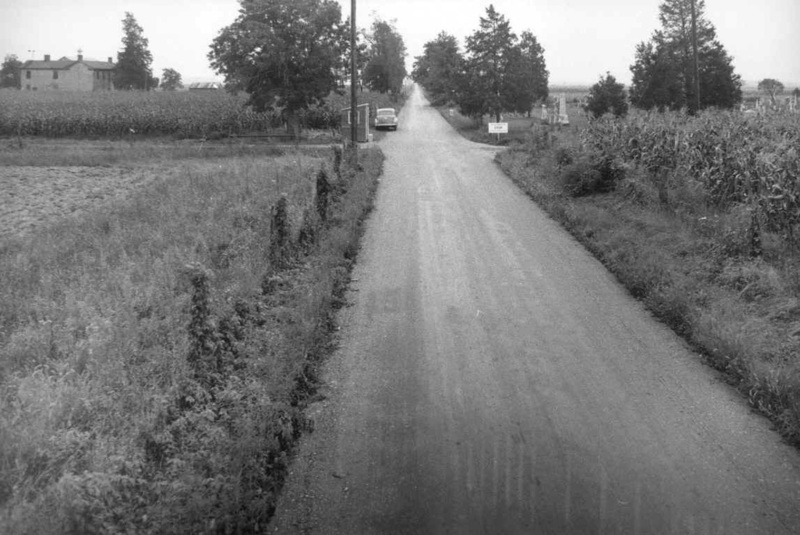 After conference with Major Gill, departure was made at 10:00A.M Arrival made at Mr. Springer's office at Columbus at 12:00 o'clock, after which conference proceeded to Camp Atterbury to discuss the possibility of getting blue-print work done by their Architect-Engineer Group at that Post. Saturday-August 1, 1942 Capt. Hammon: Mr. Norman M. Kirk of the Pennsylvania Railroad called to say that his company was prepared to work with us as soon as possible. All available information as to length of track and necessary switches was given him with the request to call the Columbus Office in one week. Monday-August 3, 1942 Capt. Hammon: The Area Engineer was intervened by a local newspaper man who asked for information, but was refused until proper authority is given from the District Engineer. Tuesday-August 4, 1942 Capt. Hammon: Arrived at office. Mr. Hager arrived and after conference with the Area Engineer assumed his duties as Chief Clerk. Two guards were hired for the office building. The Area Engineer was again intervened by a Reporter, at which time he gave some information as to his private life. Wednesday-August 5, 1942 First Lieut. Austin Griffith: First Lieut. Austin Griffith assigned to Columbus Air Support Command Base by Col. Hutchings, executive assistant through Major Gill. Left Louisville under Travel Order No. 315 at 5:00P.M. Talked to Major Gill about project at Columbus. Secured Site plan and Building plans. Secured use of surveying instruments at Camp Atterbury. Also received data on cars for use on project from Lt. Ritter. Arrived at Columbus, Indiana at 7:10 and reported to Captain S. O. Hammon with plans, information and data requested. Thursday-August 6, 1942 Capt. Hammon" Miss Bertha Cristie, of the Rationing Board, came in a few minutes after calling for an appointment with the Area Engineer. She asked for information on the Air Base which would enable them to obtain a larger tire quota. The Area Engineer gave her the required information upon seeing her credentials. Friday-August 7, 1943 Lt. Griffith: Secured information on routing instructions from P.R.R., C.C.C. & St. L. (N.Y.C. ), Railway Express Agcy. Train Service, Bill of Lading, availability of spurs of connecting line, length of spur track on project and capacity. Saturday-August 6, 1942 Capt. Hammon: Major Gill introduced Mr. Tracy of A. Farnell Blair (telephone Edinburg 680) as the probable contractor on the entire group of buildings. This company is doing a large part of the Camp Atterbury construction. Mr. Tracy made an appointment to be at the Columbus office Monday to talk over the work and view the site. It is expected that a negotiated contract will be made with him Monday. 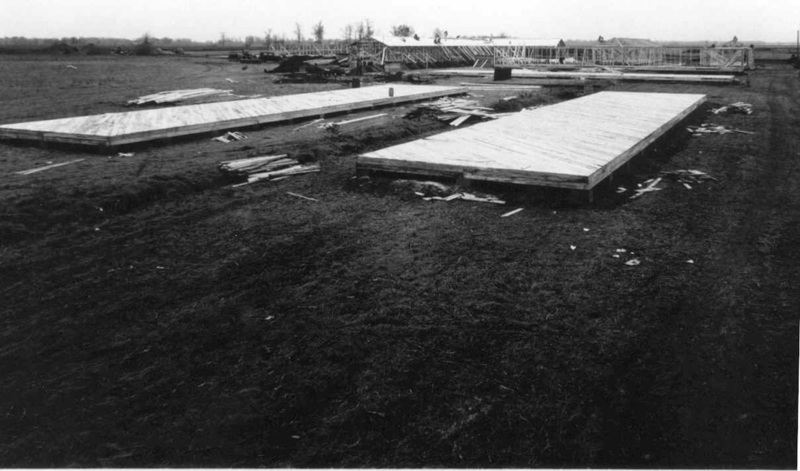 he mentioned that he had about a million feet of surplus lumber at Camp Atterbury. Monday-August 10, 1942 Lt. Griffith: The Lieut. worked up guard data left by Chief Holt. Set-up under division A/E group for payment of salaries: Chief Guard-$2000 per yr. (Civil Service transfer) Senior Guard-$2000 per yr. (under A/E) Guard-$1800 per yr. (group). The Lieut. will discuss further with Chief Holt and Mr. Kain August 11 regarding possible hiring date, pass books, sentry houses (to be contacted with Local Lumber Company for Lump Sum bid on houses) and heating equipment complete. Tuesday-August 11, 1942 Capt. Hammon: At 9:30 Capt. 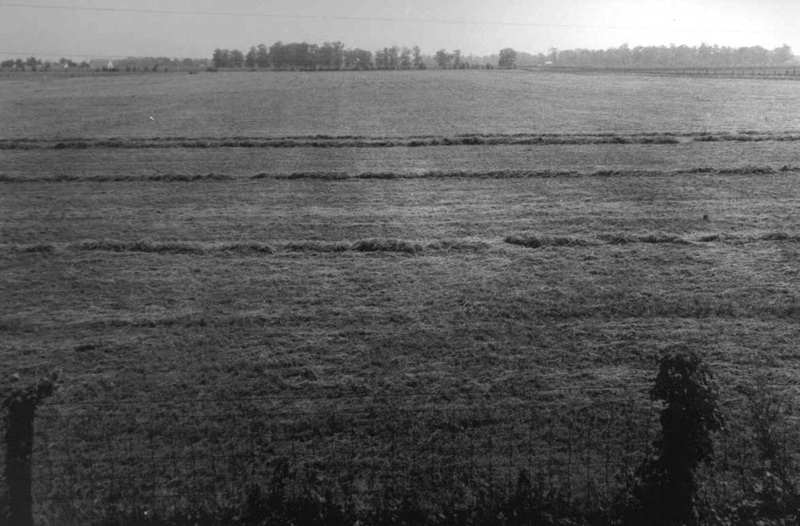 Hammon went to the Field with Bob Marshall, newspaper man, to look over the situation concerning the removal of graves. The Lieut. issued information for bidding on 12 units of cars or trucks to be stored locally, maintenance of units. Bids to be submitted within the next three days. Lt. Griffith contacted Deaver Garage, 2nd & Jackson, Columbus, Vulc. Co., 5th and Jackson, Reeves Auto Co., 5th and Jackson, Ed. Schaefer, 429 W. Third, Columbus, Indiana. Lt. Griffith submitted data for bids on Sentry Houses to various local lumber cos. :Wendel Bros., 1416 Sycamore, Dunlap & Co., 522 Jackson, Gro. Robertson, S. Sycamore, Foss & Luke Taylor Lumber Co., 1425 Cal. St., and Schoonover & Eddy, 1111 Third St., Columbus, Indiana. Thursday-August 13, 1942 Capt. Hammon: At 9:15 Mr. Hesse, District Photographer came in. He left a shot time later with Mr. Coleman, Resident Engineer to take site photographs. Mr. Matthews brought up the subject of electricity which he discussed with the electrical expert from the Division Office. Mr. Matthews said Bartholomew County REMC would require a total of 14,000# of copper and steel while Public Service Co., would require about 29,000# each case would be new material. At 8:00 P.M. a meeting was held in the Chamber of Commerce room with the dispossessed property owners of the field, Mr. Springer of the Land Acquisition Board, Lieut. Griffith and the Area Engineer. A talk was made by Mr. Doup, Mr. Springer, Lieut. Griffith and the Area Engineer, after which the meeting was thrown open to questions of which there were many. Such questions were brought up concerning disposition of crops at time of evacuation, possibility of the owners buying back or retaining houses, barns, etc. The meeting was closed at 10:30. Tuesday-August 18, 1942 Capt. Hammon: At 2:00 P. M. the Area Engineer left for the field with Mr.. Coleman, Resident Engineer, to see if work had started on the site, but found only one piece of equipment and no workman. Lt. Griffith: Lt. Griffith gave Mr. Hager, Chief Clerk, an order to buy the following from the lowest bidder, Westermeier Hardware Co.; 12 flares @$1.10, 6 lanterns, No. 2,@$1.49, 144 flashlight batteries @ $.09. Wednesday-August 19, 1942 Capt. 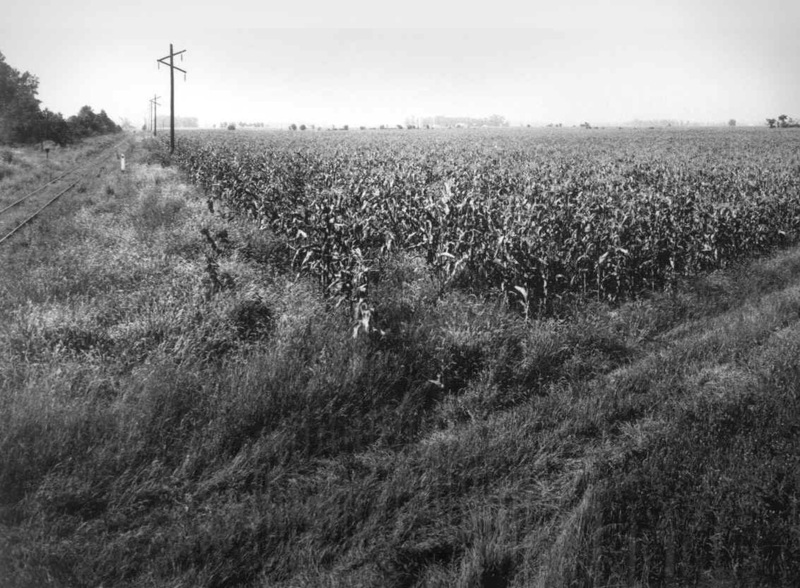 Hammon: The Area Engineer and Lt. Griffith went to the field on an inspection trip and found that the contractors had started actual construction in removing fences, obstacles, and clearing fields, etc. upon their return to the office a telegram was sent to the Chief of Engineers informing him of the start of construction. Plans are being made for moving graves from two small cemeteries inside the air base area. Present plans call for moving them to Liberty. 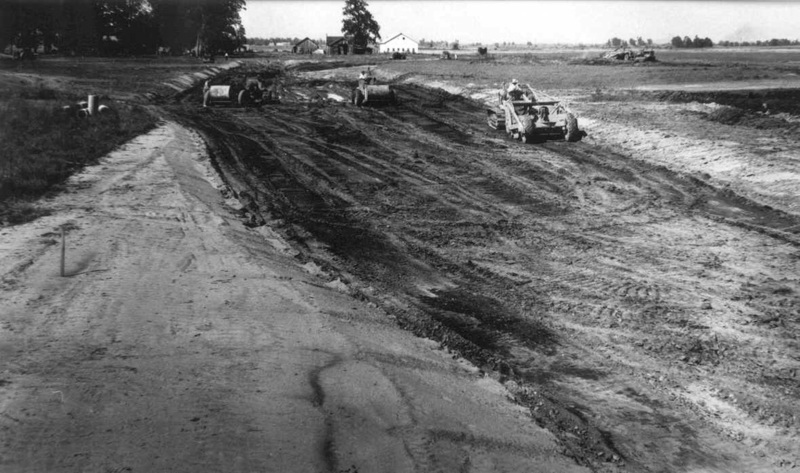 Roads through air base site closed today August 24, 1942. 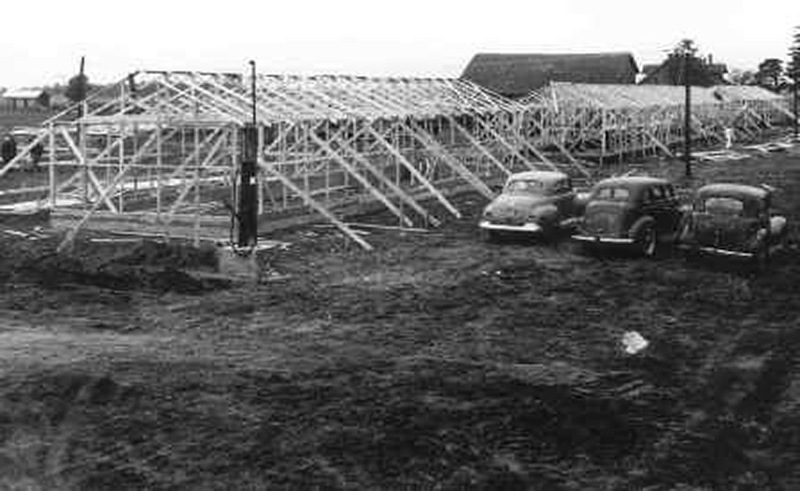 Graves were moved to Liberty today August 24, 1942. Learn about air base land owners HERE. All graphics, images, and content are the property of the Atterbury-Bakalar Air Museum. the alteration, or manipulation of image files is authorized.